Do you ever have moments when you lay down in bed and an idea hits you? So do I. This idea was one of those. 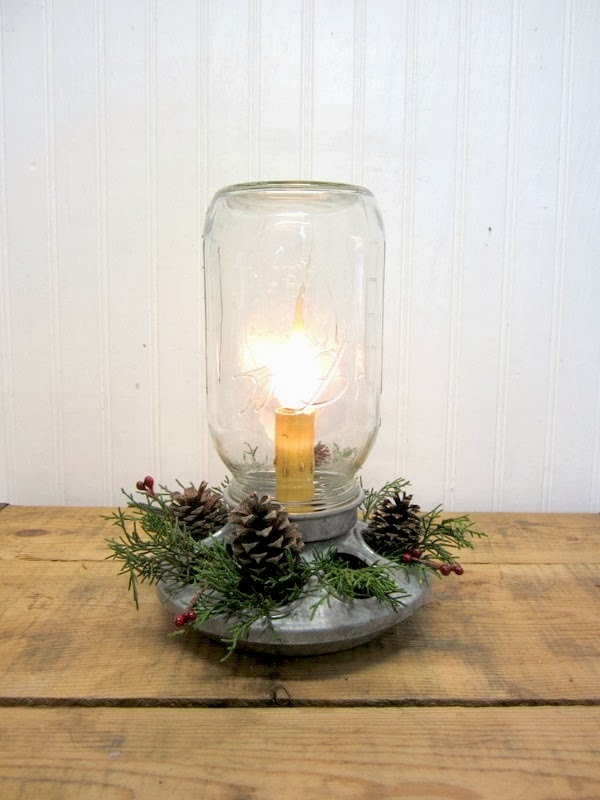 I already had a few primitive candle lights, some mason jars and a couple of galvanized chicken feeders in my stash. 3rd - placed the gold bolt through the hole from the bottom of the chicken feeder and screwed the silver column part of the light onto it from the top. (forgot to take a pic) 4th - ran the wire through the bottom hole and through the silver column and reattached the wires. 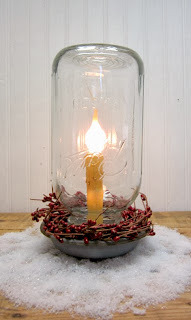 As you probably noticed I used a Blue Ball mason jar and a clear jar. I like them both. What do you think - blue or clear? 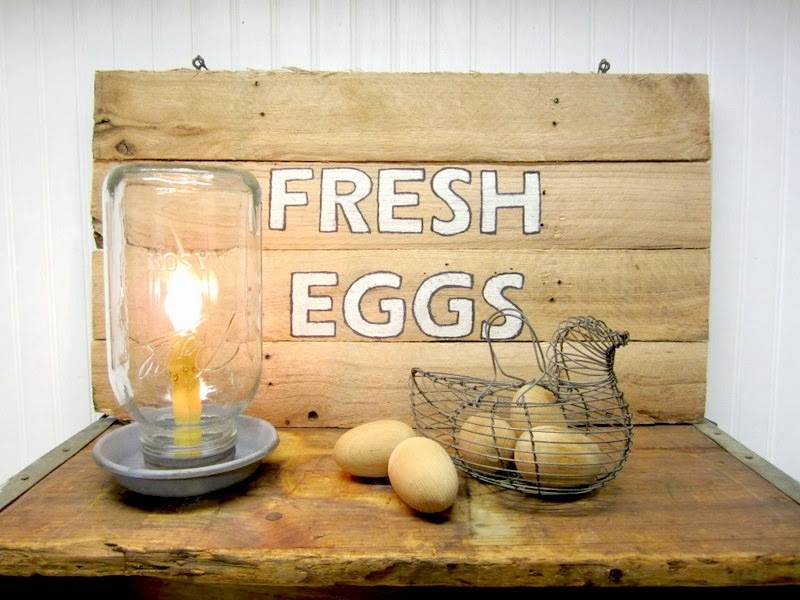 I also made a second lamp with a half gallon jar and a different style chicken feeder. The feeder part of this one is like a bowl. Lots of decorating options here too. I added a wreath of red pip berries in the pic above and left it plain in the pic below. 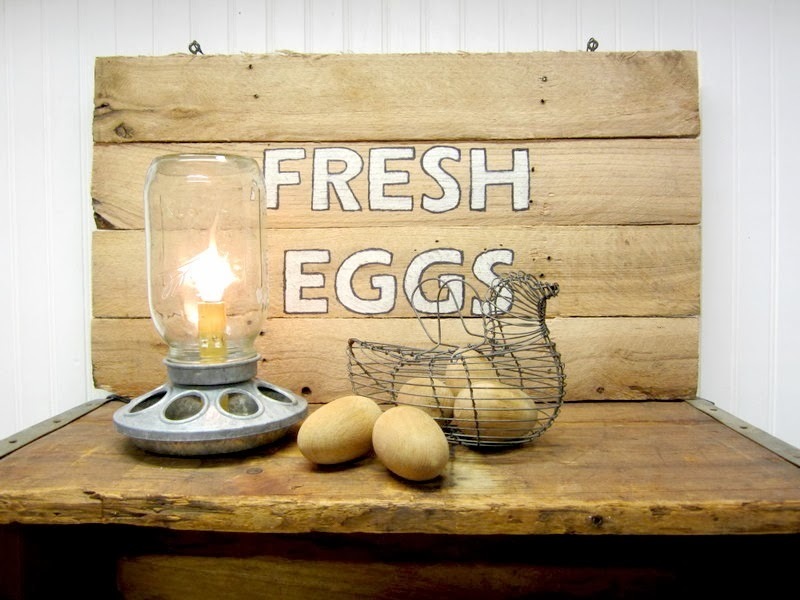 The FRESH EGGS sign was a pallet project. The chicken egg basket was a find today and all of these items are available in my Etsy shop. How would you decorate one of these lamps? Made my way to your blog from a linky party. I really enjoyed reading about your cabin - what an interesting and exciting endeavor with a lovely result. Love your idea for the feeder lamps - very cute. I can think of several people I'd like to make them for. Speaking of our cabin, I need to get the rest of the construction posts finished so I can share all of teh fun projects we've done inside (& are doing). that looks great, what a neat idea! Those ideas that hit me while I'm laying in bed are always the best ;). Love this, Adina! My favorite decoration is the red pip berries. Absolutely adorable - I like both of them! Thank you so much - heading over to your blog now! That is really cool! It's a great idea. And it would make a great gift. Thanks Heidi! I'm thinking about keeping one for my kitchen. 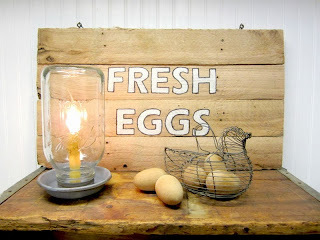 Your lamp looks great and I really like how you found a new use for mason jars and chicken feeders. Very creative! Thanks for sharing this project at The Pin Junkie. 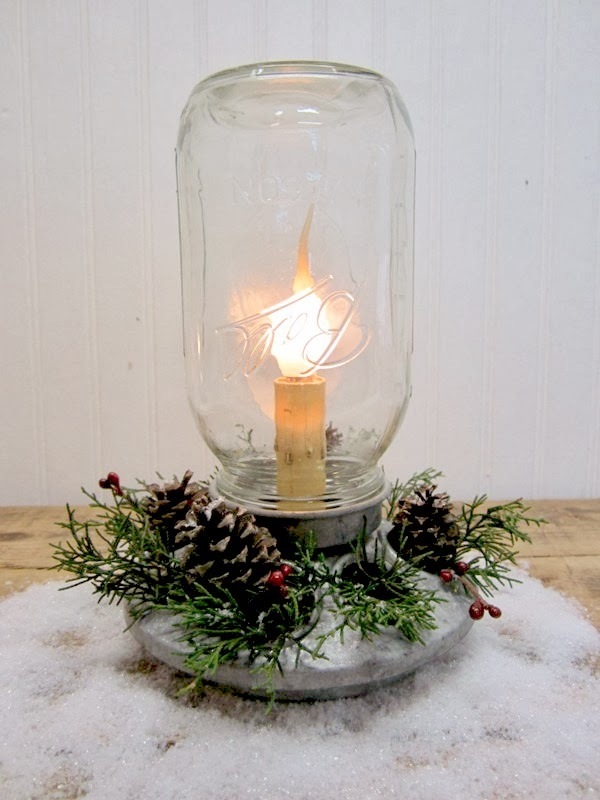 It was featured in today's Christmas decorating roundup. http://www.thepinjunkie.com/2013/12/christmas-decorating-ideas.html Hope you can stop by and grab a featured button and be sure to share your best Christmas crafts at tonight's party for another chance to be featured. I love it!! Very creative! !